Two separate mentions for Raven Ridge. Windows 10 x64 16299.64, Graphics Driver: 23.20.768.0, 1920x1080"
With two more CPU cores? Read about it a bit earlier and saw that there actually weren't any consumer grade 7nm parts being released until next year. I doubt it but it would be nice.. Doesn't appear to be anything special, according to the internet. 35-45W high power 4C/8T mobile. It still sporting the name Raven Ridge and the model number 2xxx makes me expect a straight port without any changes. But the energy efficiency gains shown on the slide need to come from somewhere, so 7nm may be the cause? Or an actual optimized 12nm unlike PR? Yeah, the planned 7nm APU is Matisse which at the usual rate would come out in late 2019/early 2020. Assuming a linear scale RR 2017 is at about 12x while RR 2018 is at 16x, this is a 30% improvement, far from the announced 2x+ from 7nm vs 14nm, so this can be implemented with a mature GF s 12nm. Na, no chance in hell this is 7nm, makes no sense what so ever. As others stated, this is most likely 12nm. Yeah, APUs lag pure CPUs. APUs will only get 7nm after main CPU only parts do. If there is a release before then, it will almost certainly just a process tweak to "12nm". Or an actual optimized 12nm unlike PR? I'm expecting this time AMD will optimize libraries of 12nm. No, Matisse is codename for Ryzen 3xxx series based on Zen 2 and Picasso for successor of Raven Ridge. The old codename fir 7nm APU was greyhawk.. don't know if it was changed. So, what are we looking at here? Is this just a binned Raven Ridge based product with an expanded thermal envelope? 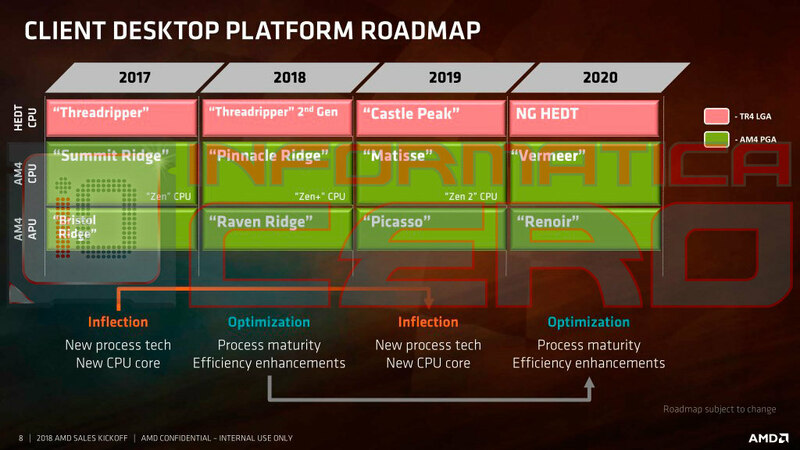 Then, in another 6 months, we'll get Picasso, which is a "power and performance optimized Raven Ridge architecture chip" as according to earlier slide releases? Or, will Picasso move to the 12nm process with optimized libraries? The efficiency uplift in the 3.6-3.9Ghz range for that process is significant. If they tweak the thermal and power management policy with respect to turbo frequencies, and maybe also enable PBO, they could make significant performance improvements on sustained performance benchmarks and improve gaming benchmarks due to not having to throttle as much without making any major increase in peak turbo frequencies. It would be essentially a BIOS update drop-in for any of the existing released products while improving most every benchmark for performance and battery life. You're right, I was thinking of Renoir (first 7nm APU following above pattern), the APU version of Vermeer (Zen 3). Edit: Wait, Vermeer doesn't even mention Zen 3 in this slide. Is Zen 3 for 2021 now? I really want to see how the 12nm RR will get this high perf/watt, unless they have managed to get better efficiency from memory and iGPU. I think that 12mm RR is going to get that power gain from operating more in the sweet spot of the Mhz/Power curve. It looks like RR is currently pushing past the inflection point on the curve to get it's rather impressive (for an APU) performance. If they keep the Mhz ratings sensible for 12nm RR, they'll be in a much better spot on that curve, and, in addition, the IF and other bits of the processor gain a lot from the improved process. That should help with idle power and non-turbo conditions as well. Could that be 7nm EUV, or is that too soon? It would be interesting if Raven Ridge 2800H was 7LP/N7. That and it is the inverse of what people thought. Rather than a 35W-45W SKU, it was actually a 7.5W-12W SKU. They shrunk and enhanced Vega on 7nm. Naturally before they go Navi in APU, they will use what is already available. All we need is to find a 7nm Zen. Then, it is cut and dry that Raven Ridge got the same treatment as Vega. TSMC is already in mass production for N7. GlobalFoundries apparently is ramping to mass production with 7LP. N7/7LP without EUV has no frequency gains and only power gains. From information from another forum, but to lazy to search for it. Throwing it out a 7nm APU would be 80 mm squared with a flat optimization(Zen+Vega shrunk from Raven Ridge 2017). Vega20 sampled out by June 6, 2018 w/ launch in 2H 2018. Raven Ridge 2018 w/ Vega 2.0 IP sampled out by August 2018 w/ launch also in 2H 2018? @NostaSeronx So you think Raven Ridge is essentially just Zen+ regardless of process node and even the iGPU can change? Honestly I think this is all way too optimistic. I just have no idea at all how Ryzen 7 2800H and the slide from OP fits with all the roadmap info we got up to now. "We knew 7nm would be a big challenge, so we made the bet, we shifted our resources onto the new node," Papermaster said earlier this month in an exclusive interview with CRN. "We didn't just dip our toe in the water. We went all in." For AMD, going all in on the 7nm node meant aligning its design team, the foundries and the company's electronic design automation partners, which build all of AMD's computer-aided design tools. There is at least four versions of 7LP. EUV 7LP and 5LP are the same thing other than FinFET to Nanosheets. Everything so far has indicated that Raven Ridge 2018 is a 35W APU on 14nm+ not 12LP. Agenda or not, there is still a logical sequence for moving to a new process. That involves first ironing out the bugs in a CPU implementation and GPU implementation seperately, before combining them in an APU. Just like they did for the Original Raven ridge. Also if this is still called Raven Ridge, there is Zero chance it is 7nm. Oh and GF 12nm as used by AMD in Pinnacle Ridge is just 14nm+. There is no shrink at all. 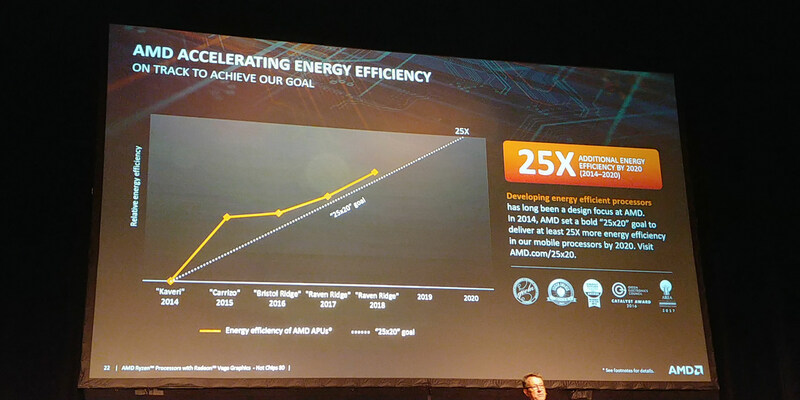 If Raven Ridge 2018 is 14nm+ how does it achieve the energy efficiency gains shown in the slide? Edit : According to AMD 12LP provide 10-15% improvement over 14LPP, if we take the lower figure for 14LPP+ to 12LP improvement then the perf/watt improvement at isofrequency is 25% at same design, with a few power management tweaks it shouldnt be difficult to grab the remaining 5% to get to the numbers of the alleged Raven Ridge 2018. Also the 2X+ improvement brought by 7LP imply that the 25X target will be largely exceeded since RR 2017 is at 12X on the curve, and that power managements should help raise the bar even further, actually they wouldnt even need to redesign the thing, a shrink would be enough. Current tools are bad at predicting future performance. So refreshed bins potentially can have increased TT(nominal) corners or whatever. Edit: process performance is never static, GlobalFoundries, TSMC, everyone increases the performance of their node over time. The HP lineup peaks out on 25W TDP. So, it is a refresh that might be 15W-25W like the 2300U SKU. Following the above switch for A9-9400 to A9-9420. 2800H w/ 3.35 GHz & 3.8 GHz @ 15W-25W TDP. With focus of it being more 25W rather than 15W. Like the A9-9420/A9-9425 for 15W. Current tools are bad at predicting future performance. What are the current tools you re talking about, sliding rules and logarithms look up tables.? ?.